22 March 2017 – The international dairy sector has set eleven criteria to come to a sustainable way of working. One of these criteria is the reduction of the emission of greenhouse gasses. The recently finished TiFN project ‘Reduced methane emissions of dairy cows’ shows that selective breeding can reduce methane emissions of dairy cows. The Dairy Sustainability Framework, which unites many international sector organisations, has set eleven criteria to come to a sustainable dairy sector. Globally, improvements on soil nutrients, soil quality, biodiversity and animal welfare are needed. The sector also needs to significantly reduce the emission of greenhouse gasses. These emissions vary greatly between different parts of the world. In North-Europe, where cows have a large life milk production, greenhouse gas emissions are relative low per litre milk. Nevertheless, the Dutch dairy sector aims for a further reduction and wants to achieve a 30% reduction by 2020. More than half of the global-warming impact of milk production is caused by methane production from cows. 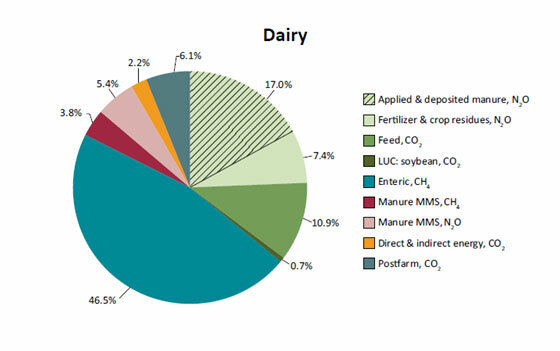 To find clues how to reduce these emissions, several parties in the sector joined hands in 2012 and started the TiFN-project ‘Reduced methane emissions of dairy cows’. Project partners were CRV, Lely Industries, Qlip, Centraal Bureau Levensmiddelenhandel, ZuivelNL, Federatie Nederlandse Levensmiddelen Industrie, Ministry of Economic Affairs and Wageningen UR. A seminar to mark the end of the project was held on March 14 in Wageningen. During the seminar, results obtained in the project were presented and implementation of results was discussed. The seminar attracted about 85 participants representing many actors involved in the topic, such as farmer representatives, the Ministry of Economic Affairs, breeding, dairy and feed industry, and research. The first step in the project was to develop methods to measure the methane emissions of individual cows. The project team developed two indicators. One indicator is based on the milk composition, the other one is based on air expelled by cows. Both indicators were used to collect methane emissions of large numbers of individual cows on commercial dairy farms. These data of both indicators give breeding organisation CRV valuable clues to reduce methane emissions through breeding. The outcome of the project serves as a building block to come to lower emissions. To come to a sustainable sector, also the other ten criteria of The Dairy Sustainability Framework should be fulfilled. TiFN is currently developing programmes on some of these topics. One thought is how regenerative production can be achieved within one generation in the Dutch agriculture landscape, including economic and social consequences. What mix of land based and landless (stables, greenhouse) production systems fits within planetary boundaries? What type of production can best be done at what location? And how much output can thus be achieved in a net positive system? If you are interested in this new programme, please contact Wouter-Jan Schouten for further information.